Impuzzables are really great puzzles ! Impuzzables, the puzzle for any adult or child aged 7-plus - with 6 difficulty levels. Yellow is easy for an average 7 year old, Orange is a fair bit harder, Green is quite hard, Red is really hard, Blue is extremely hard - and White is near impossible for the most able adult ! Why not try these great puzzles ? Or someone would love one or two as a gift from you !? Or buy 40 for your company conference to get minds going !? Visit our Online Store for these great cheap puzzels to buy now - Impuzzables ! 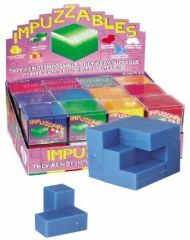 The easier Impuzzables - Yellow, Orange or Green - only £3.99, click to BUY now !! The harder Impuzzables - Red, Blue or White - only £3.99, click to BUY now !! "I did love doing these Impuzzables." "Great puzzles, with a little help from my children ! "